This is the 3rd time for Gone Running Club (GRC) to join the Globe Run for Home. We have chosen to support the Habitat for Humanity and help build homes for our less fortunate brothers and sisters. 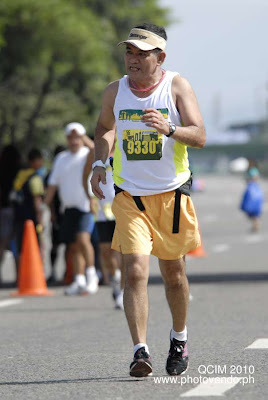 It is always good to run for a cause. You get to enjoy the run and at the same time contribute in helping others. Speaking of helping others, it is in the best interest of GRC to help our runners whenever they level up on their race distance. Since Jay and I were able to do marathons, ultra marathons, and triathlon, we thought of paying it forward to help our runners to step up and eventually do their first half marathon, or full marathons. We train them, taught them what we've learned through our experience, and pace with them on their debut run. 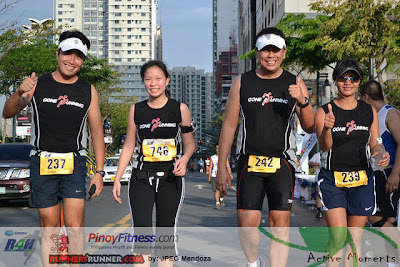 If you recall, in December, we paced with Kuya Ernie Carandang who ran his first full marathon. On weekend long runs, he was always there and try as much as possible not to miss a run. He did finish well and is now looking forward for his 3rd marathon this year. Now he is trying to motivate his brother (Val) to do his first marathon as well. 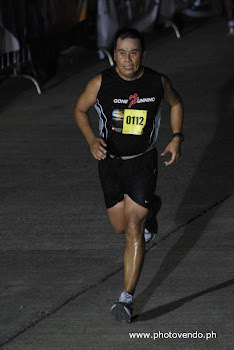 In February at the Condura Skyway Marathon, it was Cherry Jardiniano's marathon debut. She was supposed to do her marathon at the QCIM together with kuya Ernie but since she was sent for a month in the US for a business trip, she decided to defer it to February. 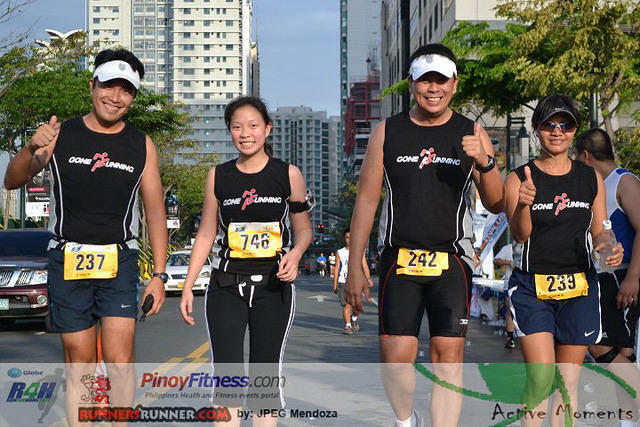 During her first marathon, kuya Ernie joined me and Jay to pace with Cherry to give her the support that he had during his marathon debut. Cherry finished strong and now she is geared to do her first ultra marathon, hopefully the PAU 50K within the year. Now it was Cherry's turn to pay it forward as she also joined us in pacing Tiffany Qua who did her first half marathon (21km) in Globe Run for Home. Tiffany is also a member of GRC and she completed her first 10k at the Condura Run in February. After that she decided to level up to 21k, a brave move but definitely a good one. Prior to the race, we were giving Tiffany inputs and guidance on what she should do during race day. Her farthest run before the race was 17km and she felt pain on her legs and was really exhausted. After that, she was doubting if she can make it. But the fact that she was able to run 17km was an indication that she can finish the race. Jay and I were motivating here that she can do it and it was just a matter of managing her pace and monitor her nutrition and hydration. When I saw her at the starting line on race day, I knew she already conquered her first half marathon, we just have to enjoy the run until we reach the finish line. I was designated to monitor our pace, we set it at 8:00 min/km in the first 10km and see how Tiffany would respond halfway through. Time was not a primary objective, but would want her to finish below 3 hours. What was important was for her to finish the race feeling strong. But since I was tracking the pace, I must admit that I was trying to pick up the pace once in a while and we managed to maintain a 3 min buffer from our target pace. I was eyeing for her to finish at least at 2:45. It was very impressive to see her walk only on aid stations. She had no complaints and was determined to finish the race. During the walk breaks, I had to do a 10 sec countdown to start running again so as not to waste more time. At km 17, she started to slow down and feeling the fatigue but still no complaints. If we say run, she will run. At km 18, she said that it seems to be her longest 3km! Taking it one step at a time we finally reached the final turn and saw the finish line. As we approach, we told her to finish strong and try to sprint. She was tired but she was determined to finish strong and she did sprint approaching the finish line. She completed her first half marathon in 2:50:46. It was a great accomplishment, good job! It was indeed a good feeling to be able to help others accomplish their goals. It is equally rewarding when you see them cross that finish line. Tiffany's experience in Globe Run for Home will tell whether she dread the distance or would love to come back. And yes, she finally decided for a comeback, and SOON! She is doing the NATGEO half marathon this weekend and hopefully beats her time. Take time to pay if forward, you will be glad you did. Enjoy the runs!